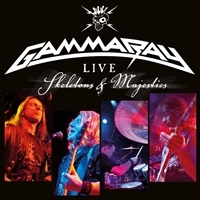 Gamma Ray needs no introduction. The band around Kai Hansen has earned its stripes over the past years. A lot of popular songs are not on this album, but what else can you expect when you have such a mighty repertoire. Sure some of the fans will be missing few of their favorites, but the fact is that there are unexpected songs on this album, which makes it more interesting. I only got the live CD to review, but there is also a DVD and that is probably even more interesting. Besides a DVD with the songs below there is also a second DVD with six songs filmed in a local club in Bochum, interviews and older live material. With the Vicious Rumors live CD still in my mind I have to say that this gives a lot more satisfaction. The most special track is "Gamma Ray", the original version is from the band Birth Control and another song that I did not expect on this album is "The Spirit". Songs like the epic track "Insurrection" and of course "Future World" form a perfect final piece. "Rebellion in Dreamland" and "Send Me a Sign" are performed acoustic and the icing on the cake are the songs with Michael Kiske on vocals; "Time to Break Free", "While in Dreamland" and of course "Future World", all are brightened up with his appearance. Henjo Richter, Dirk Schlächter, Daniel Zimmerman, Corvin Bahn and Kai Hansen know how a live album should sound like and if the DVD has the same quality, I can recommend it for certain.